I love Arkham City, but I wouldn’t want to live there. Batman: Arkham City is an excellent sequel to Arkham Asylum. If you are a fan of Batman, then I assume you’ve already played the standard game. Arkham City is just like it except it’s more and better. 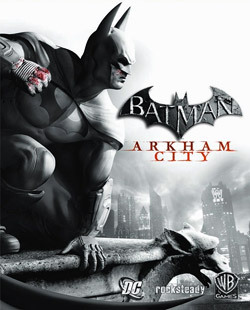 Go play it now, although if you haven’t finished Arkham Asylum and intend to then do that first or Arkham City will spoil the ending for you. It is the Mass Effect 2 of the Arkham series. Rocksteady has improved the combat with more animations, gadgets, and moves. I particularly like the smoke pellet and I can remember panicking and dropping down into a group of armed enemies in AA many times, so it’s nice to have a countermeasure. The boss fights are also better here. They are challenging but not stupidly so, there’s always a trick involved and they don’t require multiple deaths to figure out. There are no hitpoint sponges. In general, the game does a good job of introducing new mechanics, training you to use them, and then building on those with additional challenges. There are no sudden increases in difficulty, and no sudden shifts in play-style. I played and beat the game on normal difficulty, which is the mode I usually pick. There’s a hard mode which removes the counter indicator and makes the enemies more difficult, but I prefer to err on the side of too easy than too hard. After all, I mainly play games for the story and the experience of the environment, not for any sense of achievement. Besides the combat improvements, Arkham City has similar pacing to Mass Effect 2. The game’s plot is a combination of urgent main storyline and explorable open world with side-missions. I know that mix of pacing really bothers some people, but I’m not one of them. If you prefer to just focue on the main story, most of the side-missions are completable after the main story mission is finished (and the one or two that aren’t are obvious, or were to me). In some ways that might be a better way of finishing the game, since there are areas you can’t reach until you get certain gadgets which you don’t get until you’ve completed sections of the main story. I spent a lot of time trying to get to certain Riddler trophies before I had the means to actually do it. One item I was a little worried about was the number of villains being added to the game. As a child of the 80’s and 90’s, I’ve seen several comic book hero movie franchises including fall prey to the “too many villains” trap, where they try to pack so much into a single film in order to top the previous one that they don’t have from for plot, dialog (beyond one-liners), or character. Fortunately, Arkham City pulls it off. The main story focuses on Joker, Penguin, and Strange, and they are all fleshed out well (although the Joker steals the show as always). The cool part was the side-missions which included Bane, Mad Hatter, Deadshot, Riddler, Zsasz, and several others. The Catwoman/Two Face side story was fun too. With the exception of Joke and Riddler, I enjoyed the shift in focus from Scarecrow, Poison Ivy, and Killer Croc in the original game. Hopefully in the third (I’m assuming they’ll be one) game Rocksteady can pull out a few more interesting villains for Batman to face off against. So like I said at the beginning, if you liked Arkham City then Arkham Asylum is that plus a little bit more. More combat, more gadgets, more environments, and more villains. I am a procrastinator, I just finished Batman: Arkham Asylum last night. I’ve been meaning to finish the game for months, yet every night when I sat down to play I always ended up firing up the PC first and losing my night to a game there instead of turning on my 360. Despite my tardiness in finishing, Arkham Asylum is an amazing game. It completely nails the feeling of being Batman. I could say it’s the best Batman game ever, but that’s hardly an achievement. Instead I’ll say that Arkham Asylum does for Batman what Spiderman 2 and Hulk: Incredible Destruction did for their respective heroes. If you’re a Batman fan, go play it. Except if you’re a Batman fan you probably already have. So now, I can play Arkham City tonight guilt free when St. Amazon brings my present, although I’ll have to set an alarm so I don’t forget about the Adventure Company roleplaying session. The other cool thing for me about finishing Arkham Asylum: this is the first time, as far as I can remember, that I’ve ever picked up a game I’d stopped playing and finished it. I’ve watched this trailer more than a dozen times today and I’m still not sick of it yet. Ironically, I haven’t actually finished Arkham Asylum yet even though I keep planning to. Maybe this’ll provide the missing incentive? When Catwoman was originally announced I didn’t really care. She’s an interesting side character but Batman is always the main attraction of Gotham City. The gameplay footage in this trailer looks amazing though, it almost seems like she could carry the whole game. Almost. On Wednesday, the UPS guy dropped off my copy of Batman: Arkham Asylum. I’ve been able to put about five or six hours into the game so far, which means I’ve seen most of the basic gameplay including a boss battle or two. I was pretty happy with the demo and I was hoping the game would be as fun. I have been surprised and thrilled to find that the full game is better. This is the best Batman game that I’ve every played. It does an amazing job of delivering the experience of being Batman, like Spiderman 2 and Hulk: Ultimate Destruction did for their respective characters. We wrapped up Batman yesterday, and it was unrelenting in its quality. I hope you already know that for yourself – that you have maneuvered its perils and triumphs firsthand, and are aware that developer Rocksteady has delivered a cornerstone experience that defines what the medium was about in the year of our Lord two-thousand and nine. I especially like the description of this game as having unrelenting quality. The opening cut scene, the voice work, the animations, the mid-game cut scenes, the mechanics, the boss fights, everything I’ve seen and played so for in this game has been excellent. If you’re a Batman fan, this is a must buy. Growing up Batman and Spider-man were my two favorite superheroes. My experience of both were limited to Saturday morning and weekday afternoon cartoons. Living in a small town, I didn’t get any exposure to comic books until I got to college. I’ve enjoyed the recent reboot of the Batman movie franchise and I loved the Spider-man movies, although the last one was the worst of the three. I’m also reading some of the classics. Currently I’m reading Frank Miller’s Batman: Year One, and I’m planning to get Batman: The Dark Knight Returns and Batman: The Long Halloween next. So despite being a Batman fan, I wasn’t really looking forward to Batman: Arkham Asylum until I saw this video over at Destructoid. If you like the Frank Miller era Batman, go watch this now. The game play looks good, the atmosphere looks awesome, and the graphics look fantastic. It sounds so minor, and it’s not something I’ve really though much about, but I think Batman’s cape is a major element to the character and this game really seems to have nailed it.